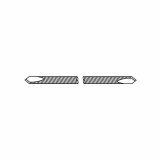 Below are a few of our most popular cerclage wires, k-wire (Kirschner wire), and stein (Steinmann) pins. We can reference any catalog number from any company. If you don't see the pin or wire you are looking for, contact us.